Sometimes feel like you were born in the wrong era? Do you crave the nostalgic sound of your grandparents’ Sunday music? Or maybe you have a few boxes of old records gathering dust in your storage you want to put to good use? ​Then buying a turntable might be one of your agendas right now. There’s nothing like popping out a record off its sleeve and enjoying the unique sound of good old vinyl. And many people agree. Despite the prevailing digital music format, vinyl records sales along with turntable shipments have consistently risen for the past decade according to consumer reports. So, there’s no need for you to scour thrift shops or flea markets.You can definitely buy good quality and brand-new turntables with speakers today. Let us help you find the best turntable with speakers that will bring your record collection to life! Check out our compiled list of the best turntables in the market arranged according to different budgets and equip yourself with tips on what features to look for with our turntable buying guide. Here we have the ten best turntables with built-in speakers and turntable-speaker packages that you can easily order online. More in-depth discussion of their specs, pros and cons, and performance will be found after this table. Now let’s delve deeper into why these turntables come out to be the best ones on the market today. Find out what features and specs make each standout and weigh in each one’s pros and cons. If you’re looking for the most affordable turntable that’ll still do the job, check out 1byone’s mini stereo turntable. This compact modern turntable is capable of playing any record speed format you might have. What more, you won’t need to buy any additional equipment to start listening to your records. Just pick up your favorite record, slide it on and press play. 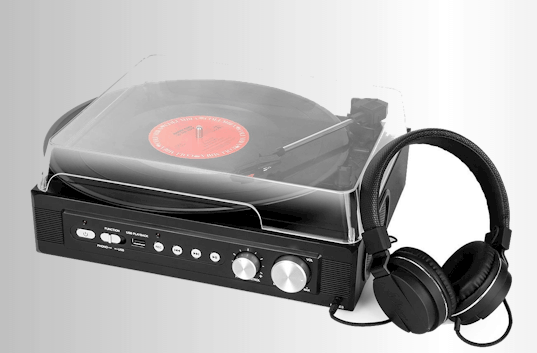 This belt-drive turntable also comes with features that will accommodate your modern music needs like its USB playback option, which allows users to listen to MP3 format music on the turntable by plugging in a USB and a vinyl-to-MP3 recording option which allows users to digitize their records. 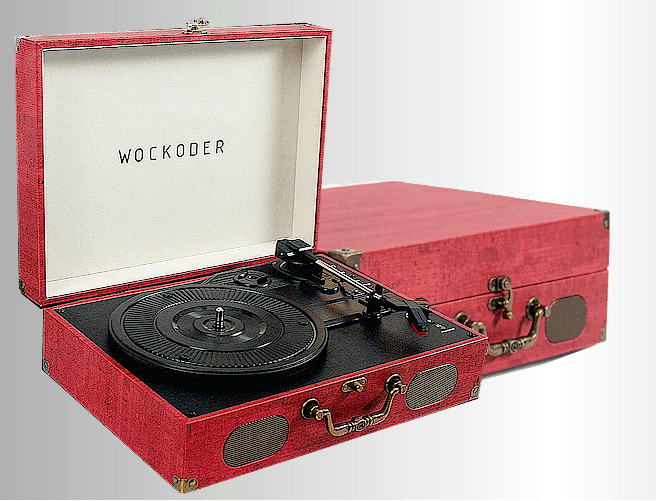 The Wockoder Portbale Briefcase Turntable is another affordable and compact turntable that audio beginners will surely find sufficient. Its main selling point is its beautiful vintage design that gives it that classic, old timey look. The turntable itself comes in a portable briefcase in various colors like pink, blue, gray, khaki and black. It is capable of playing records at 33 RPM, 45 RPM, and 78 RPM. And like the previous turntable, it also has modern features which accommodate digital music. It has a Bluetooth function, is SD card compatible and can be charged via USB. Vinyl novices will also appreciate the simple operation and setup that this Wockoder turntable requires. You won’t need to buy additional amps or speakers to get good sound from this turntable as it has built-in speakers. You can sample the sound this turntable produce here. 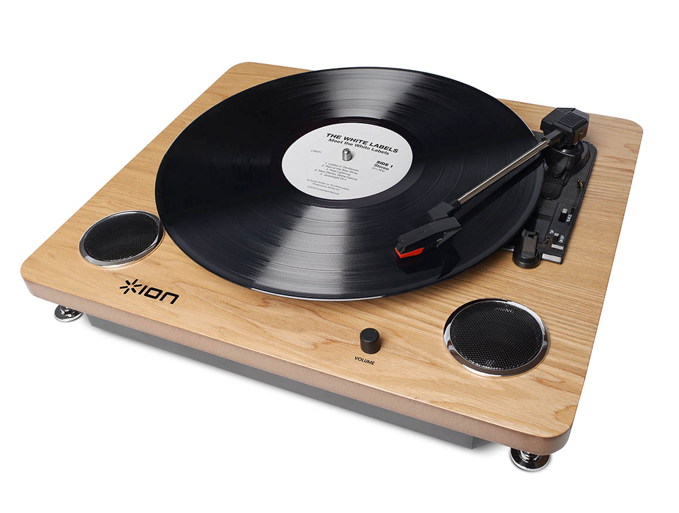 The ION Audio Max LP is one of the most affordable and best all-in-one turntables in the market. With this turntable, you can listen to all types of records with its built-in stereo speakers or plug it into your Mac and start converting your rare vinyl into digital format. You can also connect this turntable to your home stereo system for better sound quality. This turntable also boasts of an elegant and sophisticated design. It has a wooden finish platter and a clear plastic dust cover that will fit nicely in a variety of room décor. Not to mention, it comes with a 45 adapter and a free felt-slipmat. Listen to the ION Audio Max LP’s sound quality here. Another one of the best all-in-one turntables on the market is the Electrohome Wellington Record Player and Stereo System. It packs in both vintage aesthetic and modern features in its mahogany wood casing. 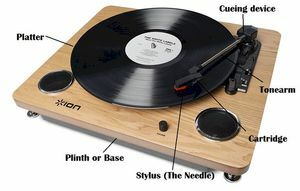 This all-in-one turntable plays vinyl, CDs, AM/ FM radio and digital music formats (through USB or 3.5mm auxiliary input). You can connect your smartphone, laptop or tablets to play music on it as it’s also a stereo system. Its built-in speakers are designed within the wood case to optimize its rich and room-filling sound. You can also rest assured that this player won’t damage your records. It has a Conical-shaped sapphire tipped ceramic needle that produces warm and natural tones without doing harm to your vinyl records. Check out the warm and natural tones we’re talking about here. Pyle competes in the style and functionality departments with the Pyle PVTT15UBT Turntable with Speakers. Like the previously reviewed turntables above, this Pyle turntable offers modern features while letting you enjoy your old vinyl records. Its built-in Bluetooth music and receiver and full range stereo speakers allow for streaming both your records and digital music from multiple devices such as smartphones and tablets. Not only that, it can also play music directly from USB flash drives and SD cards. This turntable packs all these features in its elegant and vintage housing case which can surely be your living room’s centerpiece. It also has a collapsible lid to protect your player when not in use. Just the look of this next turntable will make you want to buy it. This Electrohometurntable-stereo system hybrid is housed in an artfully-crafted wooden cabinet made from real wood and a rich walnut finish. Its mid-20th century aesthetic will definitely look great wherever you put it and serve as a great functional centerpiece for your living room. But this turntable is not just about the looks. It also put primacy for sound quality and multifunctionality. For starters, this versatile player can do vinyl to MP3 conversions. Not only that, it can also play music direct from your USB and your smartphone through its 3.5mm auxiliary input. And of course, its turntable component is capable of playing 33s, 45s, and 78s records. It promises to reproduce that natural vinyl sound through its high-performance built-n speakers. If you want to sample its turntable’s sound, check out this video (skip to the 9-minute mark to hear the sound test). Since more high-end turntables don’t usually have built-in speakers, we’ve listed three relatively higher-end turntables along with their recommended speaker pair ups for those who are looking for high-quality sound performance. Our first turntable-speaker pair is the Audio Technica AT-LP60NV-BT with two Samson BT3 Bluetooth speakers. You can find and buy this bundle off of Amazon. Unlike previous turntables that we reviewed, this Audio Technica is marketed for audiophiles and people who take their music listening seriously. And this turntable delivers the quality they’re looking for. The Audio Technica AT-LP60NV-BT promises to produce warm stereo sound from your 33 and 45 RPM records. It features a dual magnet cartridge with a replaceable stylus. But its main selling point is its wireless speaker connectivity. This Audio Technica turntable is specifically designed to accommodate Bluetooth speakers for a hassle-free sound setup. What more, this will enable you to listen to music in different parts of your house with a wireless speaker. This turntable is most commonly bought with the Samson BT3 Bluetooth Speakers but you can opt out of that if you already have speakers at home. (The turntable can also be used with wired speakers). 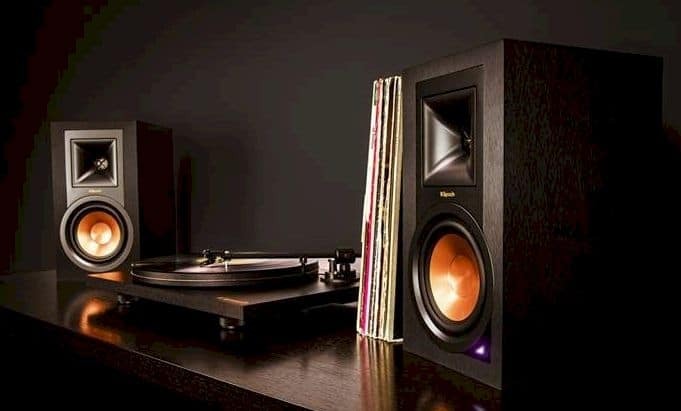 Next on our list is the Fluance Hi-Fi turntable paired with the Edifier R1289T bookshelf speakers. The Fluance turntable is a great upgrade from beginner turntables. It promises to produce genuine and clear analog sound with its high-performance cartridge and diamond elliptical tipped stylus. Not only that, this Fluance turntable includes a high-quality preamp, gold-plated RCA line outputs, and a ground terminal. Another winning quality of this turntable is its wood construction and aluminum platter which eliminates unwanted vibrations while your record is playing. Meanwhile, the Edifier speakers complement the Fluance turntable both design-wise and spec-wise. The Edifier speakers are enclosed in a similar wooden casing. It also boasts of producing studio quality audio. If you want to take your vinyl-listening to the next step, this turntable and speaker set will work great for you. The Audio Technica AT-LP120BK is a professional stereo turntable equipped with direct – drive mechanism and a high-torque motor. It is also a full-manual turntable with the capability of playing 33, 45 and 78 RPM. A great choice for those looking for an easy turntable upgrade, this Audio Technica turntable has an internal stereo phono pre-amplifier which allows for direct plugging components without dedicated turntable input. It also a vinyl to digital audio file convert feature. This turntable is usually bought and paired with the Edifier R12280T speakers, which features we already discussed above, for an amazing yet simple audio setup. If you have the money to splurge on an all-in-one turntable and music player, give the Teac LPR550USB a look. The audiophile in you will be thankful you did. This multifunctional audio powerhouse includes the following audio playing components: a turntable, a CD recorder, a cassette player and an AM/FM tuner. Not only that, it also features a USB output for computer connection so that you can record other audio formats to your computer. Its turntable component can play speeds of 33, 45 and 78 RPM and directly produce quality sound through its built-in bass-reflex speakers. Lastly, the Teac LPR550USB has a headphone output for private listening. Have a listen to the Teac LPR550USB’s sound quality here. Hipsters aren’t the only ones who can enjoy vinyl records these days. You can as well! But before you go out to buy your first turntable, here are some reminders you might want to keep in mind. Although extensive knowledge about turntables isn’t a prerequisite for you to use them, you might want to have a working idea of how it's parts work and which ones are the most important in producing music. This will allow you to know exactly what you’re paying for and determine which parts you can eventually upgrade in the future to perfect your setup. Let’s start with essential parts of a turntable and what tasks they perform. The Plinth (also Base): This part is quite literally the foundation of a turntable. Its main purpose is to support the other parts that make up your turntable and keep them stable while your record is playing. This prevents scratches and other damage to your record. The base is usually made of wood, plastic or metal. Platter: Records are played by spinning and the component on which records rest on is called the platter. It has a mat on top which separates it from the surface of the record itself and serves as a cushion to provide stability and grip. The platter is powered by a motor and can operate at various speeds depending on what kind of record you play. Most turntables accommodate speeds of 33RPM and 45RPM. But you can customize yours to play the rarer 78RPM format records as well. Tonearm: The tonearm is the part that you manually or automatically (in automated turntables) put down the record surface to play it. This part is primarily responsible for keeping the needle stable and in place on the record grooves to produce consistent sound. Cueing Device: Others consider the cueing device part of the tonearm. It kind of is at it is the mechanism attached to the tonearm which controls its operation. The cueing device is responsible for lowering and lifting the tonearm away from the record. It ensures smooth initial needle to vinyl contact to avoid scratches. 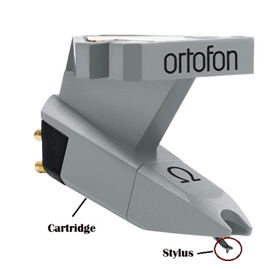 Cartridge: The cartridge is often interchangeably used with the word stylus. However, it is important to know that they are two different components of a turntable. The cartridge is the ‘housing’ which supports the stylus. Some audiophiles recommend in investing in a high-quality cartridge if you wish to upgrade your parts. Stylus: Attached to the cartridge is the stylus. It is a needle-like part and the only turntable component which comes in direct contact with your record’s sonic grooves to produce sound. This is one of the most important parts to invest in and eventually upgrade to improve the quality of sound your turntable produces. Other parts: The best all-in-one turntables and portable turntables usually have built-in pre-amps and speakers. These enable them to play records straight out of the box without buying additional equipment. However, more expensive and higher-end turntables aren’t equipped with these and thus will need external speakers. Are you looking for a basic and affordable setup? Are you willing to spend big bucks for a high-end setup? Will you be using your turntable for just listening or to study DJing with? There’s also the question of a turntables upgradeability. To give you an idea what turntables certain budgets can get you, here’s a list of usual turntable price points. Below $100: Due to the rising popularity of vinyl records, various models of low-budget turntables have become more available in the market. For this price range, you can usually get turntables with built-in speakers or are portable. Although this is a great and affordable starting point for some, low-end turntables don’t have upgradeable parts. $150 up: Although the price difference isn’t drastic, you’ll still notice an increase in sound quality produced by turntables in this price range. $300-$500: Some audio enthusiasts say that this is a great starting point for beginner turntables for people who are looking to eventually upgrade their equipment. Turntables in this price range can easily be upgraded to increase the quality of performance. The type of records you already own should determine the type of turntable you should get. Most turntables today have speed levers to adjust speed settings depending on the record format. However, some are only able to play specific speeds. Here is a list of common playback speeds for records. 33 1/3 RPM: One of the most common playback speeds and is the standard playback for 12” LPs. You can be sure that almost all consumer turntables are equipped to play this. 45 RPM: This is the standard playback for 7” singles records. Like the 33 1/3 RPM, the 45 RPM is common and should be accommodated in most turntables. As we learned above, turntables have a spinning mechanism which turns the record on the platter in order to ‘play’ it. This mechanism can come in two types: the belt drive or the direct drive. Belt drive: Turntables with the belt drive mechanism uses an elastic belt attached to the motor to spin the platter. This mechanism’s perk is that in this setup, the platter is isolated from the motor which minimizes noise transmission to the tonearm. Meanwhile, the elastic belt absorbs shock to prevent vibrations. Thus, turntables with belt drive mechanisms produce better sound. However, this type’s lower torque also means that it has less accurate playback speed. Its belt can also wear out in a couple of years thus needing eventual replacement. Direct drive: Turntables with direct drive mechanisms has the platter attached directly to the motor. This allows for more consistent and accurate playback. However, this means that this setup creates unwanted vibrations. Direct drive turntables are also recommended for those who want to get started in DJing as it allows backward record spinning and the creation of special sound effects. Although turntables cash in on the market’s nostalgic longing for old school records, manufacturers have developed modern features that users might find useful. Here are some of them. Built-in digitizing: A lot of modern turntables offer a digitizing feature (through a USB port) which would convert your vinyl records to digital formats like .mp3. This is useful if you have old and out of production records that you want to preserve or share with other people on the Internet. Pitch control: This control is responsible for regulating the rate in which the platter spins. It can also be used for beat matching and mixing various record together. Another feature that aspiring DJs may look for. As fellow music enthusiasts, we understand your desire to find the best turntable with speakers to enhance your listening experience without buying too much additional equipment. With just a few considerations in mind, you can definitely find what you’re looking for whether it’s the best turntable with built-in speakers or the best all-in-one turntable. We hope this guide has positively contributed to your search for the perfect audio setup. Long live vinyl!